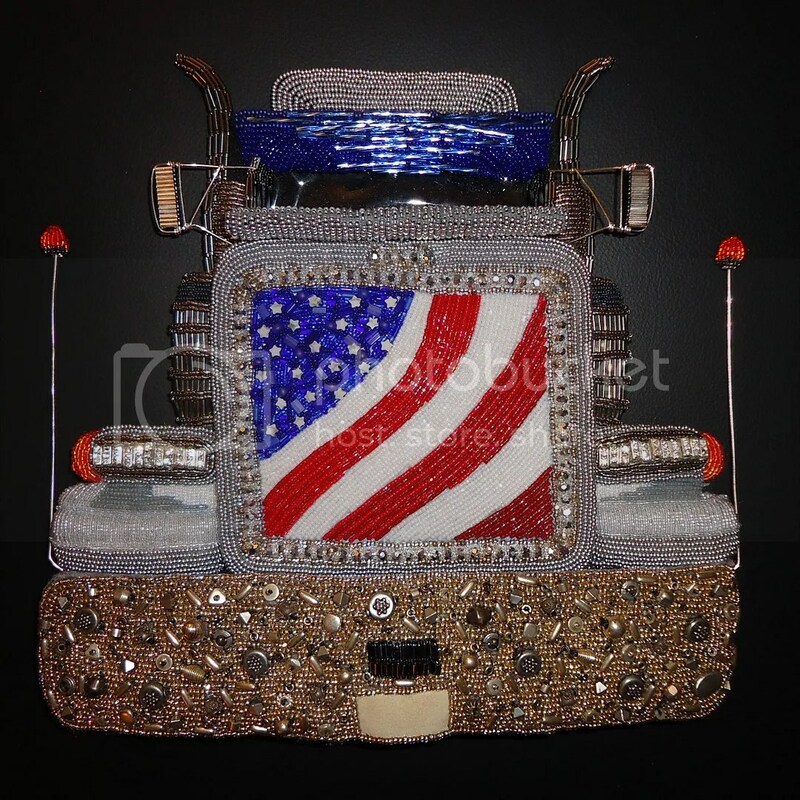 Semi-Beaded Truck, Turkey Day, & Black Friday Sale! 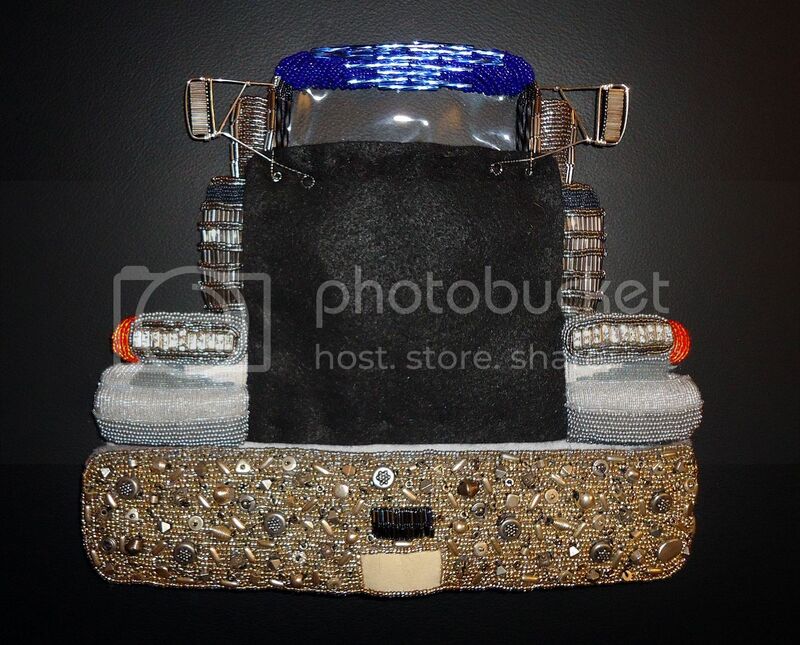 Here’s an update on the progress of my beaded Peterbilt semi- truck. 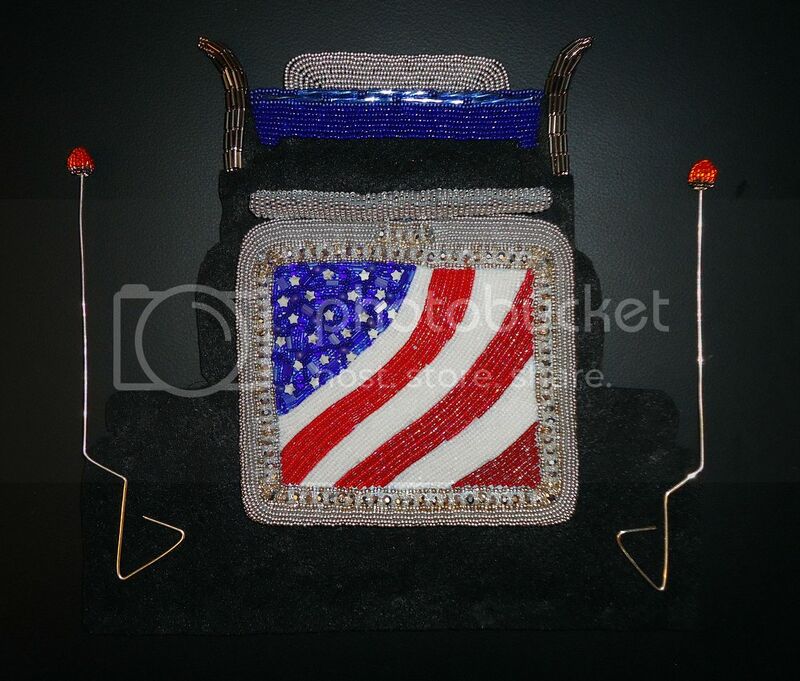 After beading the American flag grill, headlights, and cab, I created two beaded lights using 12-gauge precious metal wire. I stitched a ball of felt to the ends of them, and bead embroidered orange Delicas around the felt. I wasn’t sure this would work at first, but it turned out kinda cool! And, even though working with wire is not my forté, somehow I managed to create 2 side view mirrors by stitching liquid silver bugle beads to precious metal wire. 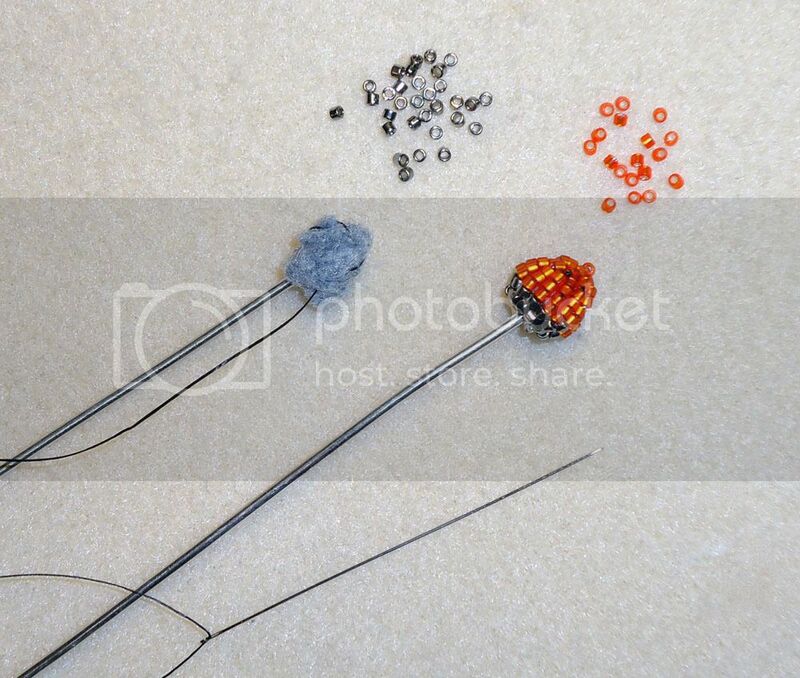 Currently, the truck consists of 4 pieces of beadwork + 2 wire lights. Nothing will be stitched together until all of the pieces have been created. I still need to add some lights on top of the cab, as well as a beaded doggie passenger:) How does it look so far? Over the next couple of weeks, I will be working on holiday orders for my Etsy shop. Please note: ALL CHRISTMAS ORDERS for custom beaded dog pins or made-to-order items MUST BE RECEIVED BY DECEMBER 14 to guarantee delivery, though I will make every attempt to ship orders placed after this date in a timely fashion. I have been pretty busy this past week. I’ve been taking care of the business aspect of beading, doing end-of-the-year paperwork, making travel plans, planning new projects, and working on my Etsy shop. I want to do a little more beading on my Radio City Music Hall painting before I show you where I’m at, so today I will share with you a quick pic of the new glass beads I got from Auntie’s Beads. 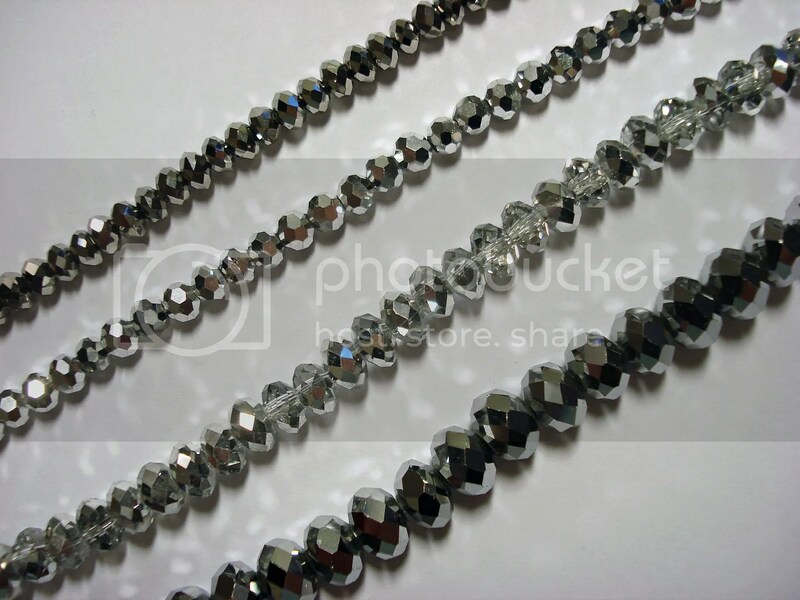 These are silver Chinese Crystal Rondelle Beads. So very beautiful – when light hits them, they sparkle like a disco ball! 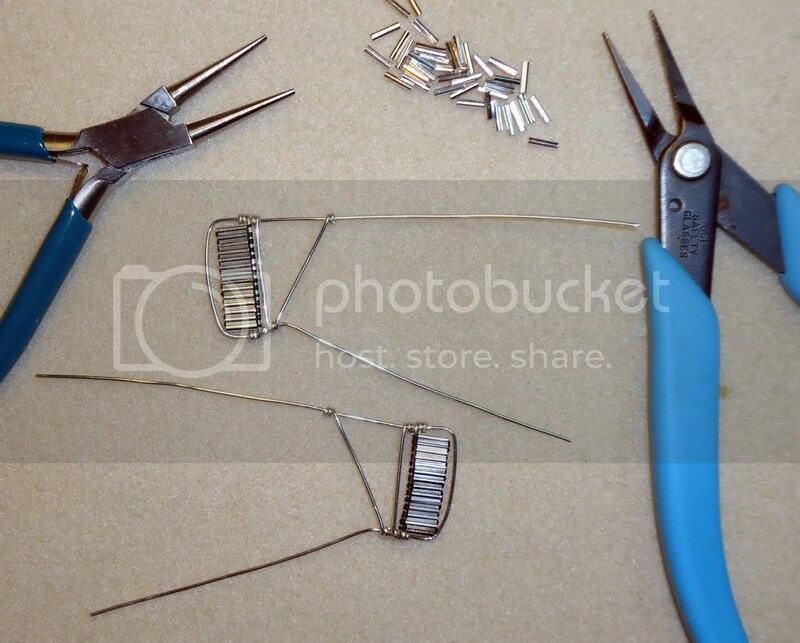 I am already considering how I can work these into one of my bead embroidered paintings! What kind of project would you use them for? *Please note: I have received the above items free of charge from Auntie’s Beads . This is my honest review of their products and I have not been paid for my endorsement as it pertains to the products received. 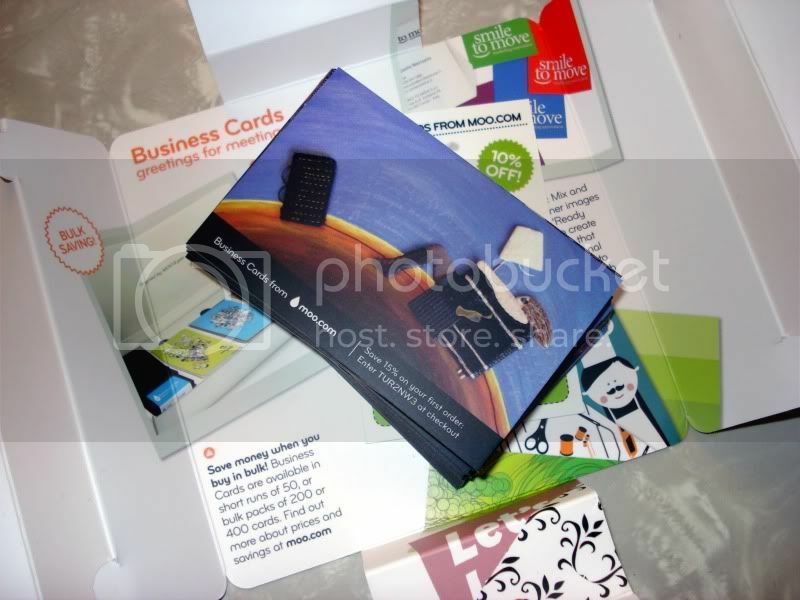 The other day, I received an order of MOO business cards – for FREE! If you have not tried MOO cards yet, I highly recommend them. They are made from a special matte laminated paper which gives them a smooth finish. 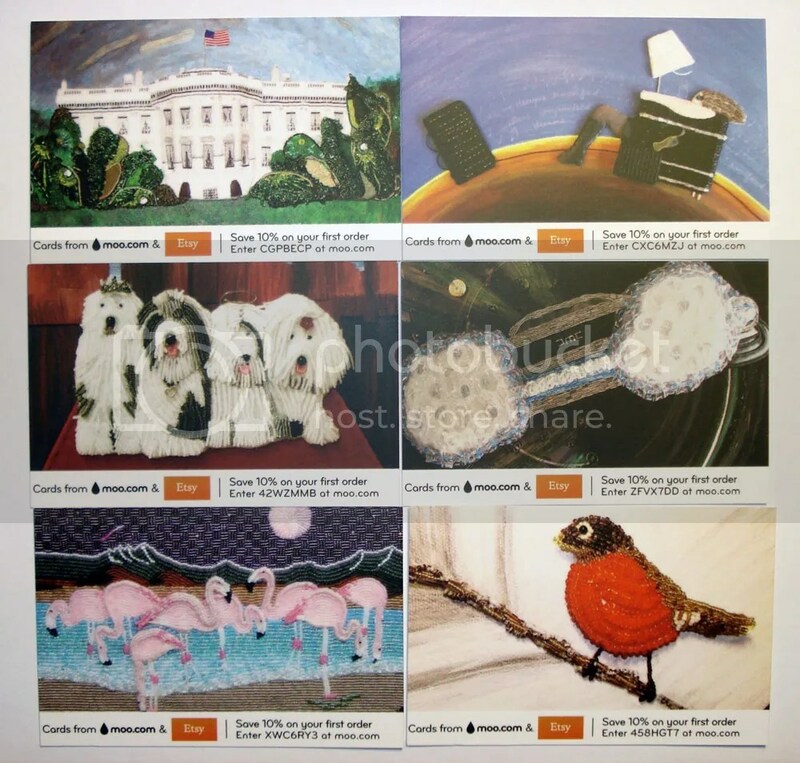 Another thing that makes MOO special is that you can upload a different image for each card. This makes each business card a collector’s item! I have ordered MOO cards a few times. 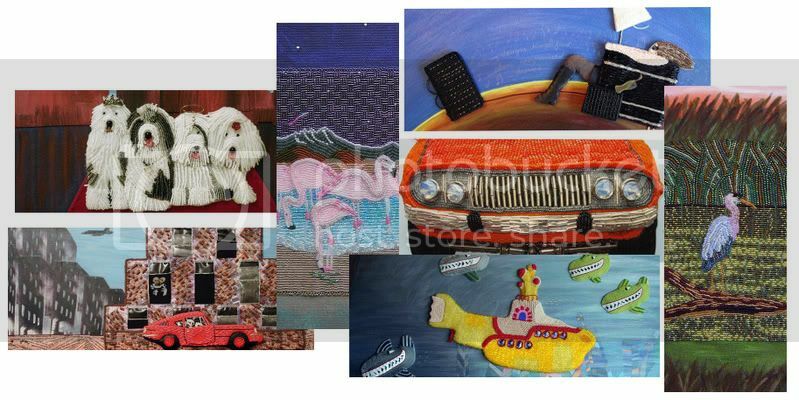 This time I uploaded 6 different images based on a number of my beaded paintings. I think my favourite in this set is my beaded White House. Which one is your favourite? I will be including one of these cards with each purchase from The Lone Beader’s Gallery Shop on Etsy while supplies last. 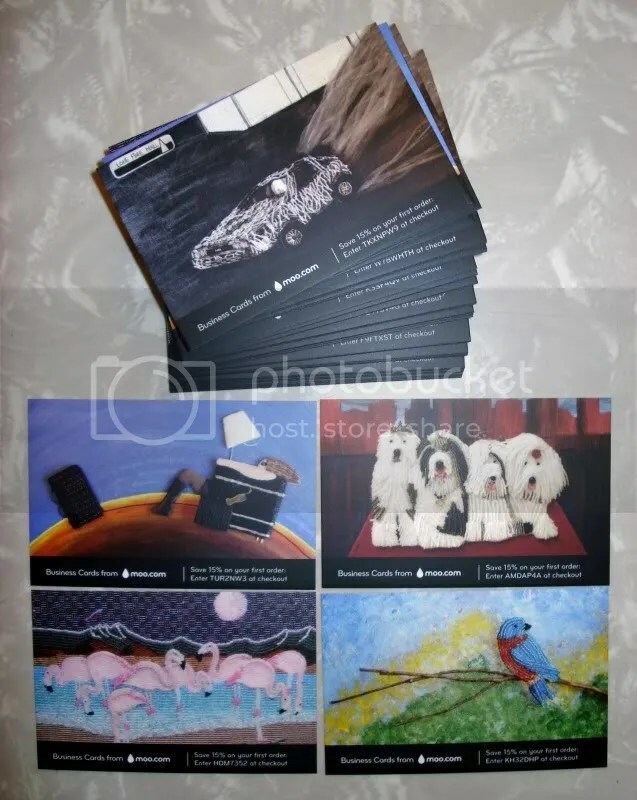 Don’t forget to order your free pack of 50 MOO business cards HERE. Offer Expires April 30, 2010. 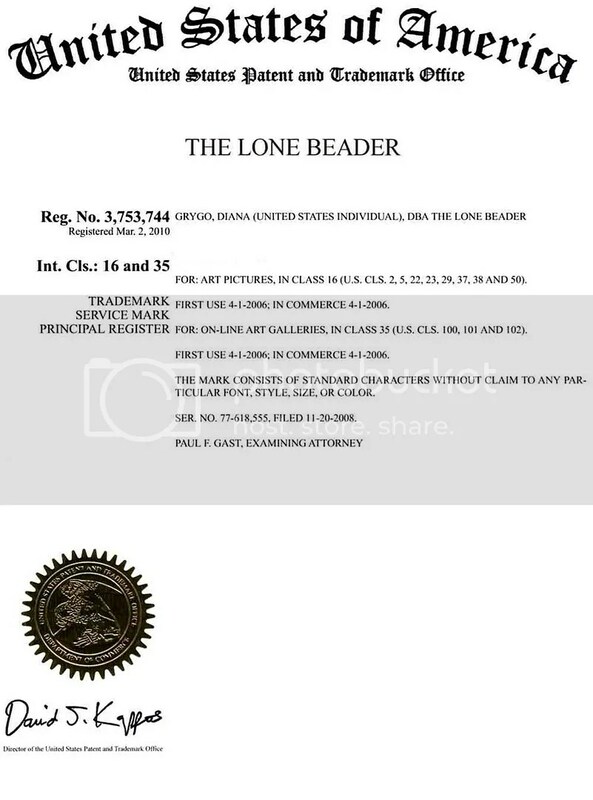 Well, it took over a year, but I finally received the certificate from my lawyer stating that The Lone Beader® is now registered in the U.S. Patent and Trademark Office! 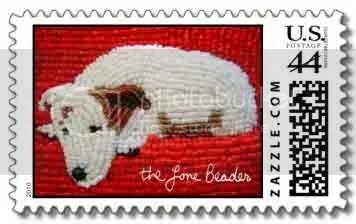 Each postage stamp design must go through a review process before it can be made available to the public. This process takes about a day. Custom postage stamp designs are a bit pricier than regular stamps from the United States Postal Service, but they are worth it if you are looking for something unique, or want to create something special to promote your business. Don’t forget- Zazzle also runs promotions on a regular basis. Please check their coupon page for more information! 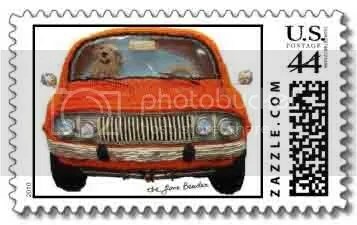 I have always had a love for postage stamps, so I’m sure I will be creating more in the future! 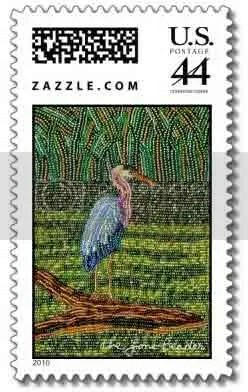 For now, there are 3 stamp designs in my shop, including Rudy’s Dream, my beaded Orange Pickup Truck, and my beaded Great Blue Heron. Which stamp is your favourite? 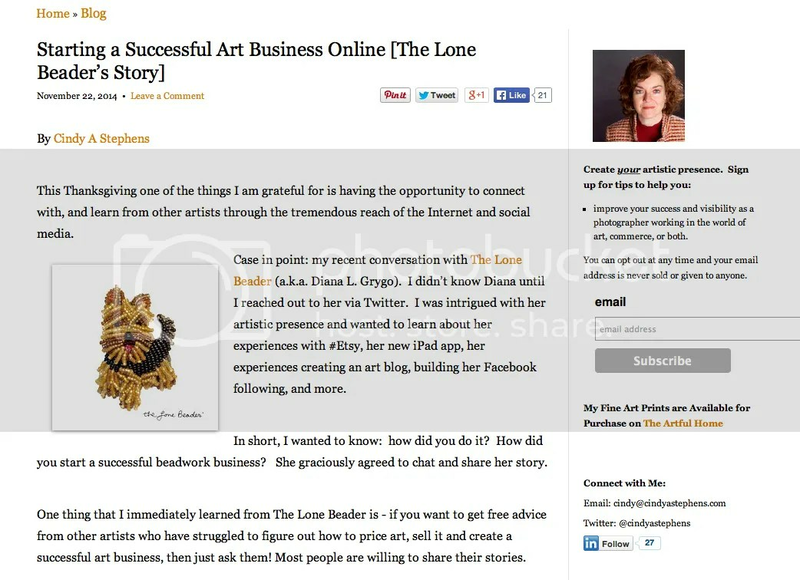 Last week, I was surfing around on the Etsy forums, and learned about MOO’s free business card offer. Coincidentally, ordering new MOO cards was already on my to-do list. I was very happy with the mini-cards I got last year, so I quickly placed my order.